The odds of us being completely alone in this vast and endless universe are slim. Now that technology is becoming increasingly advanced, we are discovering more and more Earth-like planets in far-off corners of the galaxy that have the potential to support life. As a result, it’s arguably only a matter of time before we discover aliens too. While we may be closer than ever before to making contact with E.T., there have been recorded incidents of extraterrestrial events on our planet for millennia. In fact, aliens are even mentioned in the Bible. It’s also been suggested that the Ancient Egyptians were able to build the pyramids with primitive technology because they had extraterrestrial help. Despite these incidents, there is still no absolute and universally accepted proof that aliens exist. But thanks to science fiction, when most of us think of aliens, we automatically assume that they are a lot more advanced than us humans, and it’s for this reason that many of us believe that it’s not outwith the realm of possibility for them to have already made contact. One of the most famous examples of alleged alien contact happened in 1947 when a UFO appeared to crash over a ranch near Roswell, New Mexico. A picture of the incident was published by the local paper and a national frenzy ensued, with many people believing that undisputable evidence of alien life had finally been found – that was until the military got involved. They offered a logical explanation for the seemingly out of this world picture of the crash, explaining that it was nothing more than a conventional weather balloon. However, interest in the case was renewed in the 1970s when ufologists began to speculate about whether or not this was a part of an elaborate cover-up and that aliens had indeed crashed in Roswell in 1947. Another famous UFO sighting, often dubbed “Australia’s Roswell”, happened in 1966 when Westall High School’s pupils and their teachers allegedly saw an object they couldn’t identify flying down onto a nearby wild grass field. The UFO then ascended back into the sky and flew away in a north-westerly direction over Clayton South, Victoria. The UFO was first spotted around 11:00 am. Pupils were engaging in sports outside when they saw what they later described as a grey saucer-shaped craft, which was slightly purple in color and around twice the size of a car. However, descriptions of the UFO do vary quite considerably because there were around 350 witnesses. Andrew Greenwood, a science teacher, told The Dandenong Journal that the craft he saw was silvery-green in color. Needless to say, those present did not all immediately witness the UFO. They gathered when news of its existence spread and watched it for around 20 minutes. As the UFO left the grassy field, it was reportedly being circled by two planes – further solidifying witnesses’ belief that what they were witnessing was a bona fide alien craft. The alleged presence of the planes also caused some confusion over whether there was just one UFO or not, with some witnesses claiming that there were three. The story was further sensationalized by newspaper reports, and a number of pupils were reported to have “collapsed and became ill with fright” when they saw the craft or crafts in the field. Because there were so many people present, a mass hallucination or mix-up on that scale simply wasn’t plausible, and the Victorian Flying Saucer Research Society took out a newspaper ad in an appeal for more eyewitness descriptions. Now, a fascinating interview with Westall school science teacher Andrew Greenwood has resurfaced. It was conducted by Dr. James E. McDonald, who was famed for his work investigating extraterrestrial phenomenon, according to Fox News, and because Greenwood was an adult at the time, it arguably provides more reliable insight into what actually happened than the interviews which the pupils gave. When Greenwood arrived outside to investigate, he saw a group of pupils looking towards the northeast area of the school grounds, and as he walked over, he looked up and saw a UFO hovering next to a power line. During the interview, Greenwood said the UFO was around the size of a car, round in shape, and had a metal rod sticking out of its side. He said that as he looked up, more people arrived to watch the spectacle as planes began to circle it. The teacher said this game of “cat and mouse” continued for around 20 minutes in front of around 350 stunned witnesses. The UFO then disappeared quite suddenly and when it did, all of the pupils were ushered back inside. The headmaster then told the pupils and his staff not to discuss the phenomenon that they had seen with anyone. “He gave the school a lecture and told the children they would be severely punished if they talked about this matter and told the staff they could lose their jobs if they mentioned it at all,” McDonald explained. While various conspiracy theorists have argued that the government tried to cover up the incident by once again claiming that it was caused by a weather balloon, Greenwood insisted it was the headmaster. He was reportedly so “scared” and “disturbed” by what he saw that he hid inside the school until the UFO was gone. “When the Royal Australian Airforce contacted the headmaster he told them to ‘go and jump in a lake’,” McDonald said. A number of witnesses also said that after the event they were warned by several men in black suits not to speak about it. “When he asked the physical education teacher to describe what she had seen herself so that he could compare it with his own observation, she just wouldn’t say anything,” McDonald revealed. Pictured above are two witnesses recalling the event as adults. At the time, a newspaper described the sighting as “important” because circular patches were found in the grass above where the UFO had been hovering. 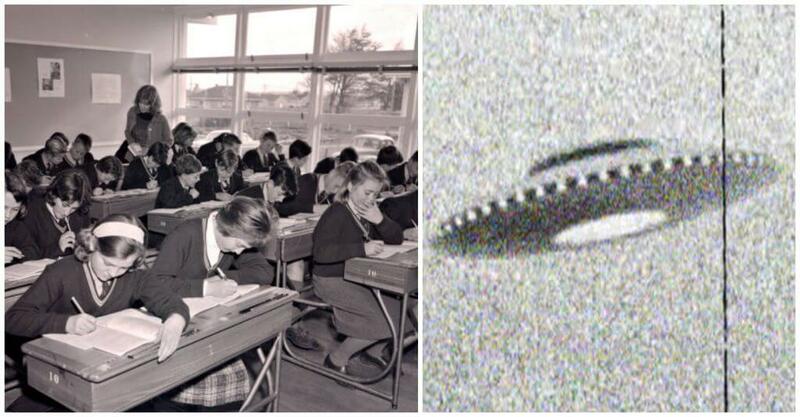 However, just like the Roswell UFO incident, the reality of what happened that morning in 1966 remains impossible to prove, but one thing’s for sure – the 350 pupils and staff present definitely saw something.